Cold cuts can refer to any kind of meat, that is precooked, sliced or cured. This is a great filling for sandwiches, but you can enjoy it right out of vacuum pack. 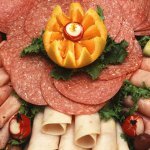 Celebrate National Cold Cuts Day that falls on March 3. Cold cuts are very popular among Americans. You can always buy cold cuts in a sealed package, at deli counter or even make your homemade cold cuts from leftovers of turkey or any other kind of meat or sausage. They come in different varieties of shapes, flavors and sizes, that is why cold cuts are perfect for sandwich, salad and pizza. It will take ages to name all common cold cuts sold in a deli. But we will name some speciality varieties, that you might haven't tasted yet: liverwurst, headcheese, tongue load, blood tongue sausage, chorizo. But if you don't feel like trying them, you can always buy turkey, ham, pastrami to make your favorite submarine sandwich and celebrate National Cold Cuts Day. You should remember one thing about cold cuts: most of pre-sliced cold cuts are much higher in nitrates, fat and sodium than those that are sliced to order.